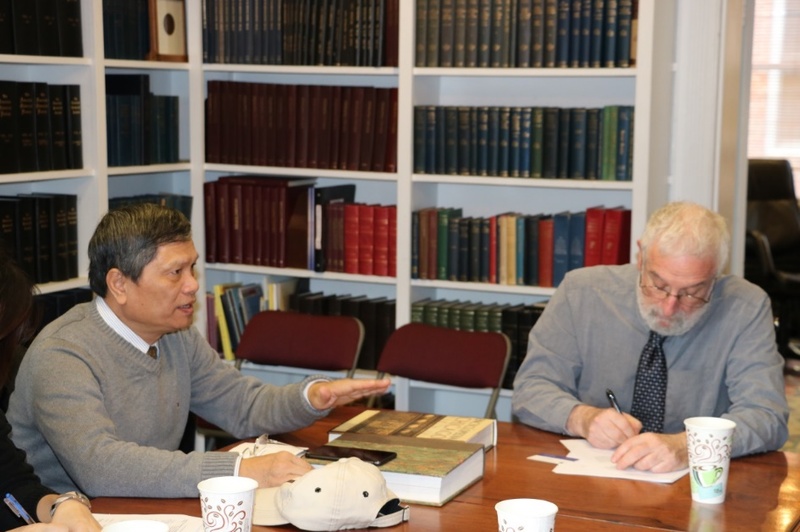 The SSRC’s Vietnam Program organized a study tour in the US for a delegation from the Vietnam Academy of Social Sciences (VASS), with the National Vietnam Encyclopedia Project. The project, which began in 2014, sets out to publish a 36-volume national encyclopedia, ranging in topic from society and culture to science and technology. The project expects to mobilize more than 600 scientists and scholars in Vietnam and around the world. To inspire the encyclopedia compilation efforts, the SSRC organized visits with disciplinary, state and regional encyclopedia projects in New York, Philadelphia and Washington, DC to learn about the conceptualization, processes and styles of organizing and compiling encyclopedias across different organizations. Visiting delegation members of the Vietnam Encyclopedia Project include Dr. Lai Van Hung, Dr. Vu Ngoc Ha, Dr. Dang Thi Phuong, Dr. Pham Anh and Dr. Pham Thi Thu Phuong. (From left to right) Dr. Dang Thi Phuong, Dr. Pham Thi Thu Phuong, Dr. 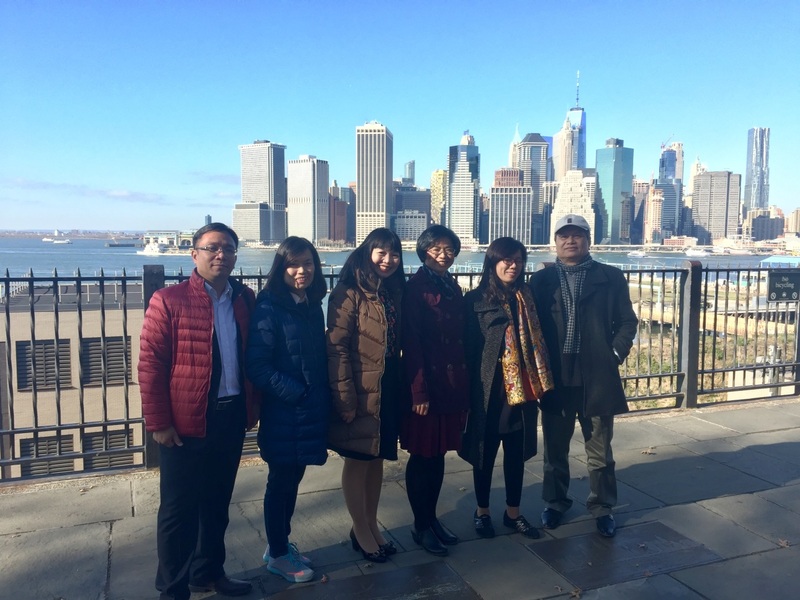 Vu Ngoc Ha, Van Tran (SSRC) Dr. Pham Anh Tu and Dr. Lai Van Hung visit the Brooklyn Heights Promenade near the SSRC headquarters in Brooklyn, NY. Van Tran, Associate Director of the SSRC's Vietnam Program, shared the SSRC's experience in compiling the International Encyclopedia of Social and Behavioral Sciences. William Ferris, co-editor of the Pulitzer Prize nominee Encyclopedia of Southern Culture, talked about place-based encyclopedia, and how to conceptualize a region and organize the sections based on cultural aspects. Edward Zalta, principal editor of the Stanford Encyclopedia of Philosophy, provided insights in meeting updating challenges and collaborating internationally with their web-based, dynamic reference model. Charlene Mires, editor in chief of Encyclopedia of Greater Philadelphia, Howard Gilette, co-editor of the online Encyclopedia of Greater Philadelphia, Tamara Gaskell, the public historian in residence at the Mid-Atlantic Regional Center for Humanities, and other project advisorshighlighted the importance of using a digital platform, civic engagement and shared authority. James Grossman, project director and co-editor of The Encyclopedia of Chicago, discussed the encyclopedia's conceptualization and organization as both an in-print and online encyclopedia. Nadina Gardner and Joel Wurl at the National Endowment for the Humanities' Division of Preservation and Access discussed their funding support for encyclopedia projects in the US and abroad. Dr. Lai Van Hung, secretary general of the Vietnam Encyclopedia Project, and Jim Grossman, project editor and co-editor of The Encyclopedia of Chicago discuss the process of organizing print and online encyclopedias.